Scenario 1: You are one of the employees. You have come to your office, grabbed a cup of coffee and started your desktop or laptop only to find that the desktop wallpaper has been changed! And, no matter what you do to Personalize again, it’s not working, i.e., your favorite wallpaper cannot be brought back! How annoying is that? Scenario 2: You run a company and you have set your company’s mission statement as the wallpaper on all of your users’ desktops. But one day you notice one of the employees’ desktop, and it’s a different wallpaper. As an employer, would you like it? If you want to prevent users from changing the desktop wallpaper, then this tutorial is right for you. Once you do this, no one will be able to change the desktop wallpaper either by right-clicking on the ‘Desktop’ to choose Personalize, or by right-clicking on an image and selecting Set as desktop background. 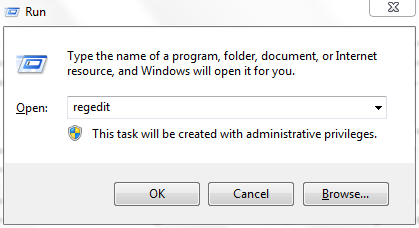 Type regedit in the “Run” dialog box (keyboard shortcut: Win + R), or in the Start menu ‘Search programs and files’ box, and click OK, or hit Enter. It’ll open the “Registry Editor”. WARNING: You are now going to ‘edit’ the registry. If something goes wrong, it can mess up your system. Look before you leap, and you should be okay! Restart or log off your system to apply the changes. No more change in the wallpaper until the registry is edited again! Oh well, some users like me (or, you dotTechies) may dare to edit the registry to alter the wallpaper, but hey, not the rest of the world. I have tested this in Windows 7 Professional 64 bit. Sounds good? Share it with your acquainted ones! Troubleshooting?